Formerly New York. Became County seat 1869. 1925 Clintonian: Sue Miller has transcribed and submitted the info from this wonderful CHS annual. 1926 Clintonian: (scroll to bottom of page) Richard L. Carstensen has transcribed and submitted the info from this wonderful CHS annual. Be sure to visit the Class of 1954 website too! This was sent to us by Elysa. It was taken from the Clinton Mirror, Saturday, May 6, 1905. Elysa has also posted some obituaries. About seventy years ago Mr. Elijah Buell came up the Mississippi river in an old steamboat called the Dubuque. He had been a pilot on the lower Mississippi, and becoming tired of this life decided to take up some land in Illinois, which was then in market. Having been on the river all his life he wanted to locate where he could see steamboats. At Meredosia he met Mr. John Baker. They decided to prospect together, and traveling up the river they reached the narrows where Lyons and Fulton are now. Thinking this would be a good point for a ferry they decided to locate here, Mr. Baker taking the Illinois side and Mr. Buell the Iowa side. Mr. Buell went down to Camanche for supplies and brought back with him a man by the name of Carron. While they were coming up the river their boat capsized and all their supplies fell into the river, so they had to go back for more. Mr. Buell and Mr. Carron, with the help of the Indians, built a log cabin sixteen feet square. It contained one room, which was used as a dining room, sitting room and kitchen combined. Then Mr. Buell went back to St. Louis for his wife and child. When they were settled in their cabin Mr. Buell began his work on the farm. In the fall his vegetables running low he went down to St. Louis to get supplies to last through the winter. When he was coming home he met a part of men driving a yoke of oxen, three cows and three calves; he bought the whole outfit. When they reached the river on the Fulton side the stock were swum across. Mr. Buell went through many hardships. Soon after getting settled in his cabin with his family, Mrs. Buell and her son took sick. There was no physician within fifty miles of the settlement and their scanty supply of medicine was of no avail, and finally the boy died. They made a rude coffin of logs and buried him. The next year many new settlers began to come. There were also a number of Indians in the settlement. They often went down the river where they could get whiskey and came home drunk. Once, when Mr. Buell had been gone all day, on his return he found his floor covered with Indians asleep. The next morning, when they awoke, they demanded more whiskey of Mr. Buell, but he told them he had none. One Indian took up his rifle and began to load it, and told Mr. Buell that he would kill him. Mr. Buell took down an iron skillet from a shelf and knocked the Indian senseless on the floor. His comrades took the Indian out without any interference. Mr. Buell thought the Indians would revenge him. One day, while he was chopping wood, he turned around and saw the Indian standing at his back; he thought his time had come, but the Indian said, "Too much whiskey -- served right." The next year new settlers kept coming. The nearest post office was at Monroe. In 1837 Mr. Bentley ran the first ferry across the river. Mr. Buell traveled over the country and circulated a petition for the first mail route through the country. School was held in the different cabins; first one settler kept the teacher and then another. The teacher's salary was one dollar a week and board. In 1841 the first school house was built. Miss Lucy Boynton was the first school teacher. In 1839 the Lyons Congregational Church was established; the first preaching services were held in Daniel Hess's cabin; they were also held in the cabin of Elijah Buell. Church was afterwards held in the old Fourth street brick school house, which was built in 1847. In 1845 A. C. Root started a bank. The first railroad was started in 1852 and was called the "Lyons and Iowa Central;" the company owned a store and paid their help with the goods from the store, for this reason it was nick-named the "Calico Railroad." The North-Western was the first railroad that succeeded; it was followed by the Milwaukee. 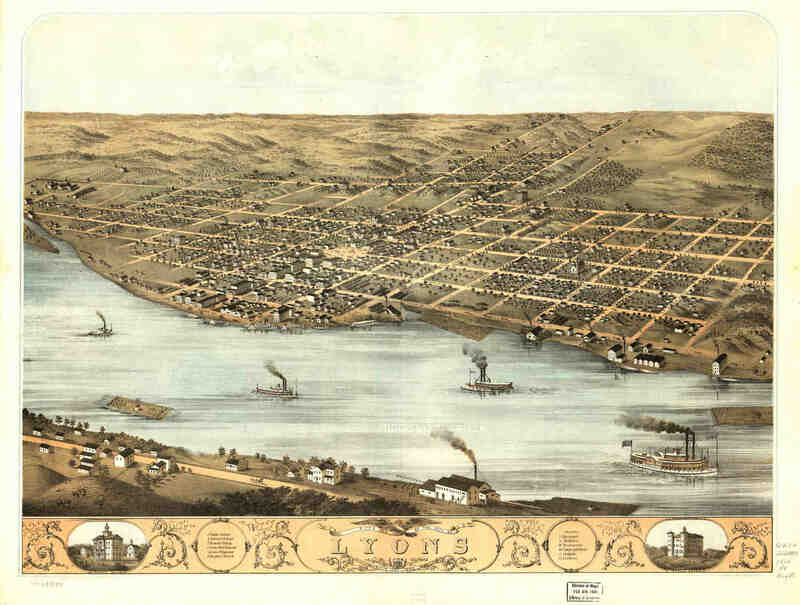 In April, 1837, Mr. Buell, Dennis Warren and several others laid out the town in lots as far as Sixth street, and called it Lyons in honor of Lyons, France. The town grew slowly, many beautiful buildings being added, the Masonic Temple, Randall House and Central School, which has the first bell of Lyons in its tower. From Richard L. Carstensen: This was at 250 Main Ave., in Lyons. 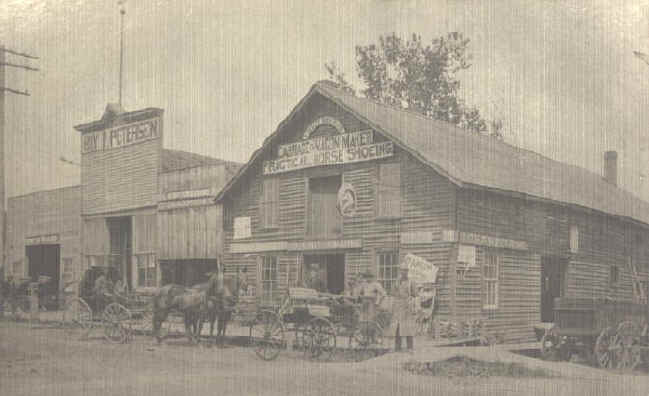 The picture was featured in one of Everett Streit's Once Upon A Time articles with the caption, "The Becker Wagon and Buggy Worker opened on Main Ave. in 1856, the first such industry in the Clinton area." This business later became the Becker Seed Co. The man on the right in the buggy is August Becker. The man in the doorway was Frederick Becker (b 20 Aug 1835 d. 24 Aug 1909). The next man is unknown and then there is Fred Becker.